As you may or may not know, Google on Tuesday revealed it’ll be naming the next version of its Android operating system (v. 4.4) after a famous chocolate-covered wafer snack. Now, with every new Android version comes a new statue for the Googleplex lawn in Mountain View. Today’s KitKat statue is exactly how you might imagine it, comprising Nestle’s chocolate bar with a couple of extra bits to make it look like the familiar Android logo. The Web giant looks to have made something of a boo-boo, however, after it posted a video of a number of Googlers going gaga over the new addition to the patch of green grass outside their offices – with one of them apparently in possession of an unreleased handset. 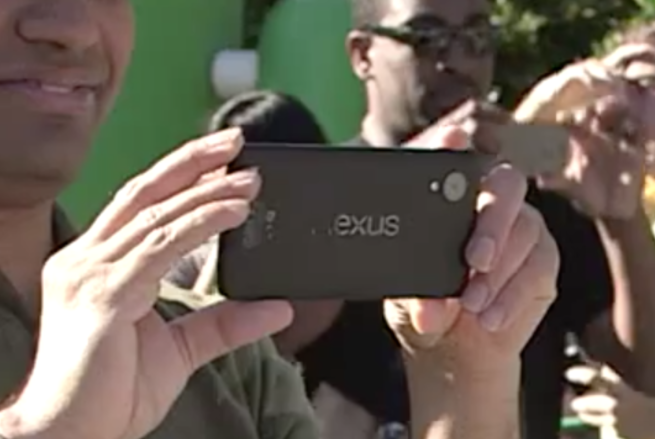 About 38 seconds in, there’s a shot of a couple of people excitedly snapping a pic of the KitKat statue, with one of them holding what many believe to be the unreleased, unannounced Nexus 5 smartphone. The video has since been taken down by Google. As pointed out by website 9to5Google, the back of the device, which is shown clearly in the video, resembles the back of the Nexus 7 tablet, with a horizontal ‘nexus’ logo. There look to be changes where the camera lens is located, too, which may link to comments made earlier this year by Google executive Vic Gundotra when he said the company intended to make Nexus phones “insanely great cameras”. Finally, it looks larger than the Nexus 4, suggesting the device, if it is the Nexus 5, could be moving towards phablet territory. There’s no official word on when the handset might be released, though rumors point to an unveiling before the end of the year. The fact that the video has been pulled suggests the company goofed up here, though it could of course be part of a clever marketing campaign designed to create a bit of buzz before the Nexus 5 publicity machine kicks in for real.